Depending on your budget and skill level, choose between one of these 3 ways to build a professional and easily-maintainable website on the HubSpot CMS. The HubSpot Content Management System (CMS) is a popular part of the HubSpot platform, a favorite in our survey of HubSpot’s favorite features. With more than 3600 marketing agencies (as of October 2017) in the HubSpot partner program all over the globe, there are no shortages of agencies who can design and launch a site on the system. But, buyer beware. There are lots of ways you can get over-charged for a sub-par product. Over the last few years, I’ve gotten to know Joe Jerome, Owner of Brand Builder Solutions. His mission is to do the opposite: help HubSpot customers and even other HubSpot agency partners build well-designed, well-coded sites that are not only attractive, but turn visitors into leads and leads into customers. Unlike most agencies and as you can see from the Brand Builder home page, they are 100% focused on this mission. And so, when we needed some help launching some HubSpot-hosted landing pages that match the look and feel of our site, I started asking him about his processes. What’s interesting about Jerome is that he’s a product and process guy, more than an agency or creative guy. Don’t get me wrong, their design work is still top-notch. But, I discovered a flexibility and efficiency in their service-offering that I’ve never seen at a web design and development agency. Need to launch a simple site on a really tight budget? Start here. Need a robust template pack so that your new-to-the-HubSpot-CMS designer and developer can launch a complex site quickly in-house? No problem. Start here. If they need training, Brand Builder Solutions has a course for that. Need to launch a campaign with a landing page and an email or just redo your blog design? Check. Have a designer, but not a developer in-house? You still might be able to get away with just their template, but if you need some dev-work done for you, they can do that too. Want to completely outsource the design and development? No problem. They’ve done quite a few of those too. Want help optimizing performance after launch? Here you go. As you can see from their pricing page, they’ve created a model that serves each of these different scenarios at an appropriate price point too. The basis of their service, and the thing that makes them efficient and affordable no matter the scenario, are the extremely flexible templates they’ve developed. They can implement any custom design by starting with their template. Non-technical users can even control many of the design elements through the custom modules baked-in to their templates. (Don’t know what that is? Here’s HubSpot’s explanation.) They’ve also made all of their templates interchangeable, so when you buy one, you can add more pages or site elements using another set of templates that will inherit your design. Most companies who purchase a template from HubSpot’s marketplace buy one based on the look and feel of it. However, once you understand how Brand Builder’s templates are interchangeable and allow design modifications through custom modules, it’s easy to see why that’s clearly the wrong way to make a decision. How the template is constructed is a much more important factor, something you, unfortunately, cannot determine by browsing the directory. Can’t judge a book just by its cover, right? The better way to build a quality site (at the lowest possible cost and with a design you love) is to first evaluate how much time and skill you have versus your budget. Let’s say that you need to launch a quick rebrand of a site in a matter of weeks to get your website overhaul started. You don’t have time to plan a full site, but you also can’t afford to let the dysfunctional existing site stay live for another day! This is a great use case for free templates, or more specifically, free template packs. You can automatically start with a consistent layout for 4-6 key pages, like a home page, a landing page, a pillar page, ‘thank you’ page and blog template. You can launch these pages without any help from a developer. When you choose a template pack, make sure you won’t have to redo your work over the following weeks or months as you continue to build out your site. To avoid that, look for free packs that are built to scale into full websites or that will work interchangeable with more robust Template packs. Once you have the basics of a new site up, you may need more templates for executing your inbound marketing initiatives. Use a template pack that will adopt the design you created with the original template pack. 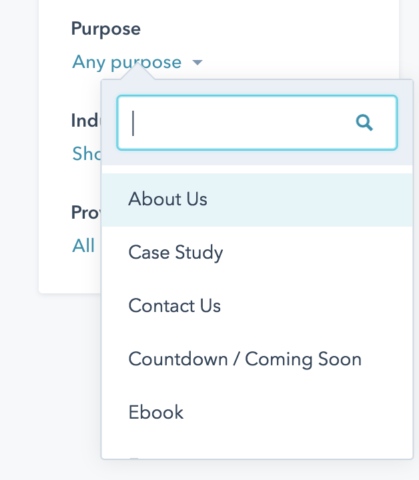 In the HubSpot Template Gallery, you can search by “purpose” as shown in the screengrab below. Of course, Brandbuilder has broken out their individual templates so that you can choose just what you need. Here’s an example of a $10 template for your email marketing. By choosing templates from a provider, like Brand Builders, you can start small and grow from there at no or very low cost. If you have a bit more budget and/or a bit fewer design skills in-house, you should choose a full-template pack that comes with guided service. You’ll still be building your site, but you’ll have expert guidance. If you start with a full template pack, you’re guaranteed to have a consistent design since any change you make will be reflected in all the pages. Many template packs include 50+ page layouts, multiple landing page, blog and email template designs. Of course, the price of these is higher. Usually, in the $1000 range. Clearly, you are now making more of a commitment, although that commitment is still 2% of what it might cost to build the same site from scratch with a web designer and developer. You also need to decide at this point if you would like to create the site with or without help from the template developer. For example, the screenshot above is the Briefcase Pack from BrandBuilder Solutions. It can be edited entirely by marketers. But, it also comes with 4 hours of consulting from the BrandBuilder team so that you can use the templates to their full potential. If you run an agency, once you learn their template system in and out, you can use your new knowledge to quickly build sites for future clients as well. If you want to build the site yourself, you still need to develop branding, copy, a sitemap and then plan content for every single page. If you are not interested in doing that, there is still good news! Most template pack providers offer complete web development services too. You can usually partner with the template creator for a fraction of the price you were originally going to pay for a full website. And, the site will still be delivered using the template system so non-designers can make changes to design (and copy, of course). Firms like Brand Builder have built hundreds of sites on the HubSpot CMS and their fees start at a few thousand dollars. Whether you’re an in-house marketer trying to get your site live (or redesigned) on the HubSpot CMS, or an agency trying to figure out how to more affordably provide this service to your clients, there are multiple paths for you. With specialized agencies like Brand BuilderSolutions, you can stay focused on building up your internal inbound marketing expertise and effort, instead of getting caught up trying to learn the ins and outs of designing on the HubSpot CMS. So, before you get started, think about the best path for you using this simple framework. 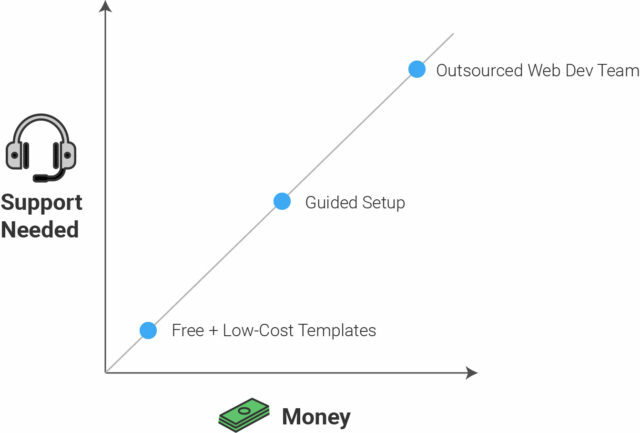 Free and low-cost templates are great for companies with access to their own design and development resources and the time to learn the system on their own. Larger template packs and guided service is best for companies who don’t have time to waste and have a bit more budget to spend. Hire a specialized agency if you want help implementing a great site quicker and don’t have the time or skills in-house. How are you building sites on the HubSpot CMS? What tricks do you have for controlling cost without sacrificing quality?